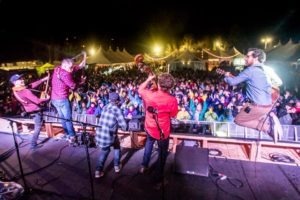 The Winter Wonder Grass festival, a celebration of winter sports, bluegrass music and craft beer, will be held March 29-31 at Squaw Valley in North Lake Tahoe. The Winter Wonder Grass festival event will feature over 25 bluegrass and roots artists with headliners Greensky Bluegrass, Trampled by Turtles, Leftover Salmon and Sam Bush Band. The Winter Wonder Grass festival will feature indoor stages in decorated heated tents, an outside main stage, a kids’ zone, VIP lounge, coffee bar, food trucks, cocktail bars, beer tastings, and more. The festival invites adventure seekers of all ages to celebrate winter sports, bluegrass/acoustic roots music and craft beer, while also enjoying North Lake Tahoe’s epic snow and spring sun and ski scene at Squaw Valley Alpine Meadows. With deep roots in Colorado, California and now Vermont, the event has established itself as a leader in the winter lifestyle culture where the quality of experience outweighs the notion of quantity. The event will feature indoor stages in decorated heated tents, an outside main stage, a kids’ zone, VIP lounge, coffee bar, food trucks, cocktail bars, beer tastings, and more. Nevada and California breweries will be on-site, pouring craft brews and ciders all three days from 2-5 pm. Sampling takes place in one of the three heated beer halls where up-and-coming Winter Wonder Grass talent shreds the side stages. Click here for full line up. Winter Wonder Grass visitors are encouraged to take advantage of North Lake Tahoe’s secret season activities – Spring in North Lake Tahoe means peaceful beaches and ski runs, lodging specials and dual sport day opportunities. Tahoe Bleu Wave: A new yacht ski charter service from South Tahoe to Homewood. Via Ferrata: A new guided outdoor rock climbing route that’s perfect for beginners. High Camp Hot Tub: Soak in Squaw’s on-mountain hot tubs while watching skiers schuss past. Northstar’s Platinum Program: First tracks access, a chairlift champagne toast, and Alps-inspired spread.